Holiday Season is upon us here in the Midwest! Thanksgiving is right around the corner and we’d like to extend the holiday cheer to each and every person this year and to let you know some various news and notes for the upcoming Wicked GT 2016! First, we are moving to the 9th Age on December 5th as part of our Battle for Oz Tournament Series. Upcoming is Round 3 – The Lion’s Pride – and it will be the first ever tournament featuring The 9th Age rules! After that we’ll close out the tournament series with Round 4 – Dorothy’s Return Home – in February 2016 and then we’ll hold our 2nd ever Wicked GT, which will be featuring the 9th Age! Registration is now open as well! Make sure to visit the Registration page if you’re interested in attending. Also note that the cost is only $50 this year! Also (and probably the most important) the Wicked GT 2016 will now be featuring The 9th Age rule set. If you haven’t visited their site then make sure that you do very soon and familiarize yourself with the new rules. All army books have been given an update and the crew from the 9th Age have committed to having them fully complete by 2nd quarter of 2016. It’s a very exciting time as we transition over to the next era of Warhammer – The 9th Age! Registration! Now open! Make sure to sign up as soon as you can! Beer! We’re working on our bar again for this year. Last year we had a keg of Bud Light as well as some easy mixers like rum, vodka, and fireball! This next year we look to build on that and bring you some more booze so that we can party all weekend long for the Wicked GT! The final menu will be released when we’ve worked out what all we’ll be purchasing! Players Packets! Updated players packets for the 2nd Wicked GT will be released shortly after the New Year! Wicked GT Trophies! If you attended last year then you know that the Wicked GT has some of the best, one-of-a-kind trophies around! They are coming back in full force this year! Golden Toto Painting Competition! This year we’ve made many changes to the painting competition. A new form will be created and each participant will have to fill it out for each entry. The judging guidelines have been updated and the form will be released after the New Year so you can review it. 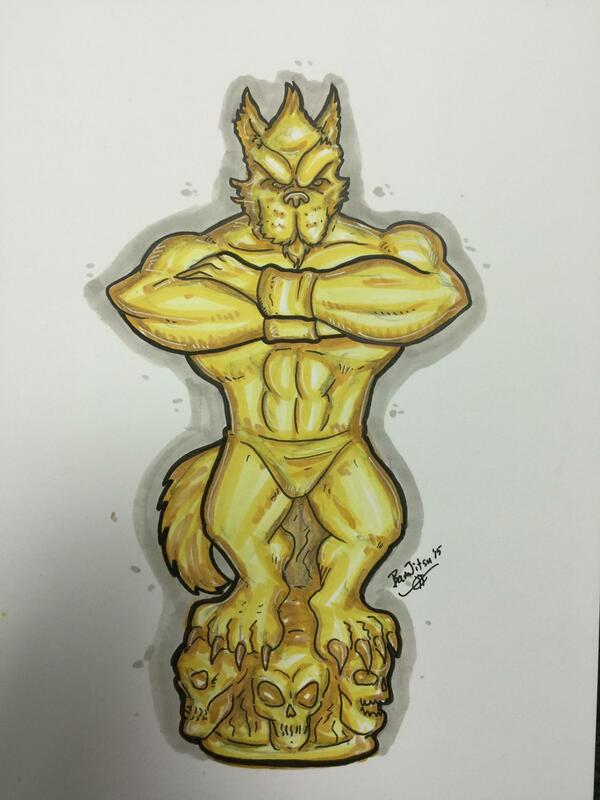 Also, Golden Toto custom trophies are being sculpted as we speak!! Each category winner will walk away with their own custom trophy! The trophies will look like this! Merry Christmas and a Happy New Year from the Wicked GT! More News & Notes!